University of Portland Junior Margaret Ehrich wishes she’d had audiobooks specially designed for kids with learning disabilities when she was in elementary school. Dyslexic, with ADHD, Margaret struggled to read and did not always feel supported in school. “I felt very frustrated when teachers would pull me aside or had me go to a special place to read,” said Margaret. Supporting kids with learning challenges is one reason why Margaret elected to volunteer at The Shadow Project this fall. Margaret worked one-on-one with students at Woodmere Elementary to select and download books in which they were interested, and then helped them navigate the text with their ears and eyes. Margaret wants kids to know that “technology is their friend.” She said: “Being dyslexic doesn’t mean you can’t do the work. Learning Ally meets students where they are. It helps with self-sufficiency, and it shows other people that students with learning challenges are still capable of reading, rather than just being read to. 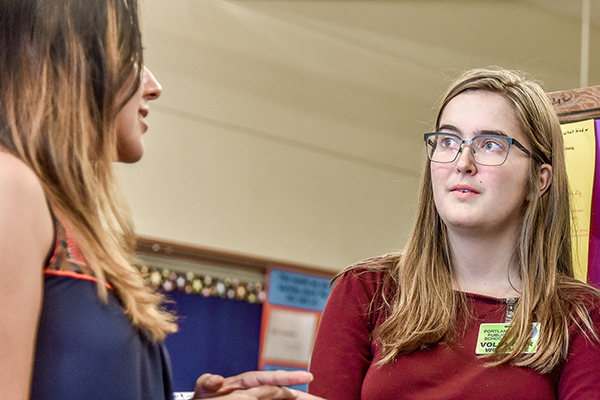 “I’ve learned that schools now are more open to learning differences,” said Margaret, who is majoring in math and, with an education minor, hopes to become a physics teacher. “School is more accessible to students with learning challenges than when I was in school.